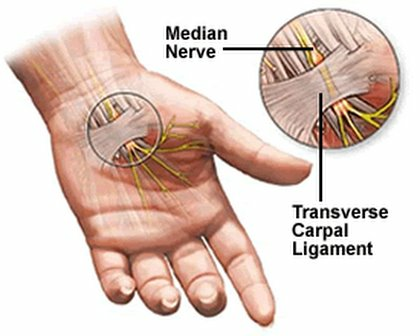 Carpal tunnel syndrome is caused by pressure on the median nerve in your wrist. People who use their hands and wrists repeatedly in the same way (for example, illustrators, carpenters, and assembly-line workers) tend to develop carpal tunnel syndrome. Pressure on the nerve may also be caused by a fracture or other injury, which may cause inflammation and swelling. In additionure may be caused by inflammation and swelling associated with arthritis, diabetes, and hypothyroidism. Carpal tunnel syndrome can also occur during pregnancy. muscle deterioration especially in the thumb (in later stages). If you have a disease that is causing carpal tunnel syndrome (such as rheumatoid arthritis), treatment of the disease may relieve your symptoms. Your provider may prescribe an oral cortisonelike medicine or a nonsteroidal anti-inflammatory medicine, such as ibuprofen. He or she may recommend an injection of a cortisonelike medicine into the carpal tunnel area. In some cases surgery may be necessary. How long the symptoms of carpal tunnel syndrome last depends on the cause and your response to treatment. Sometimes the symptoms disappear without any treatment, or they may be relieved by nonsurgical treatment. Surgery may be necessary to relieve the symptoms if they do not respond to treatment or they get worse. Surgery usually relieves the symptoms, especially if there is no permanent damage to the nerve. Elevate your arm with pillows when you lie down. If you do very repetitive work with your hands, make sure that your hands and wrists are comfortable when you are using them. Take regular breaks from the repetitive motion. Avoid resting your wrists on hard or ridged surfaces for prolonged periods. If you have a disease that is associated with carpal tunnel syndrome, effective treatment of the disease might help prevent this condition. In some cases the cause is not known and carpal tunnel syndrome cannot be prevented.